Once a hacker has created a PowerShell payload to evade antivirus software and set up msfconsole on their attack system, they can then move onto disguising their executable to make it appear as a regular text file. This is how they will get a Windows 10 users to actually open the payload without knowing they are doing so. The PowerShell payload generated by Unicorn works as expected when used against the target Windows 10 machine. It creates a reverse HTTPS connection back to the attacker's Kali setup while actively evading Windows Defender and Avast antivirus detections. This is all great, but the real challenge is tricking the target Windows user into executing the code on their computer. To accomplish this, a few things can be done to the PowerShell payload before sending it to the victim. The payload needs to be converted into a Windows executable (EXE). The icon (ICO file) will need to be changed as well to look like an ordinary text file. The biggest red flag that the fake text file is actually an executable is the file extension. 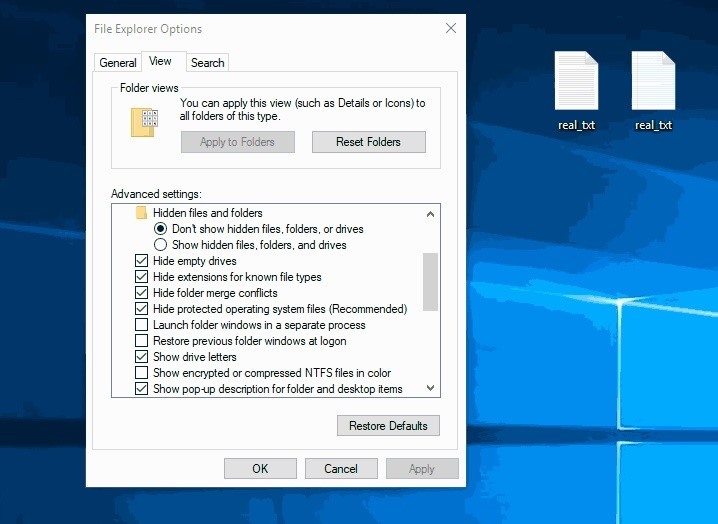 Some Windows users disable the "Hide extensions for known file types" option to protect against file extension spoofing attacks. In this article, I'll show how to spoof the file extensions — even with file extensions unhidden. The file on the left is a real text file. The file on the right is the PowerShell payload, designed to first open Notepad before executing the PowerShell payload. The following steps require a Windows operating system. I recommend using a Windows 10 virtual machine (VM) in VirtualBox. Before going further, the previously created PowerShell payload should be moved to the Windows system and saved as payload.bat using Notepad or a preferred text editor. The payload.bat will be manipulated to appear as a normal text file in proceeding steps. Windows 10 icons will need to be downloaded to begin transforming the payload.bat into a fake text file. These icons will be used to spoof the file icon. You can download the Windows 10 icons using git clone 'https://github.com/B00merang-Project/Windows-10-Icons'. Receiving objects: 100% (3495/3495), 14.69 MiB | 294.00 KiB/s, done. Resolving deltas: 100% (393/393), done. This repository may not contain exact replicas of the built-in Windows 10 icons but appear close enough and will serve nicely for the purposes of this article. If readers are capable of designing icons or locating better icons online, I encourage the usage of those. I'm using text-x-generic.png located in the Windows-10-Icons/256x256/mimetypes/ directory, but any PNG will work to continue following along. The PNG will need to be converted into the Windows ICO icon format. This can be done using online tools such as ConvertICO. Simply upload the desired PNG to the website and it will reproduce it in ICO format. Save the new ICO with the file name fakeTextFile.ico. I've featured BAT2EXE (B2E) in an article before. This is a great tool for converting BAT files to Windows executables. To download B2E, the website requires users mine cryptocurrency for several minutes in exchange for downloading their free software. If readers wish to support the B2E developer's, proceed to the download page and grab the latest B2E software. Otherwise, readers can use my mirror of a slightly older version of B2E. Using my GitHub mirror, in Windows, visit the below URL to download B2E. 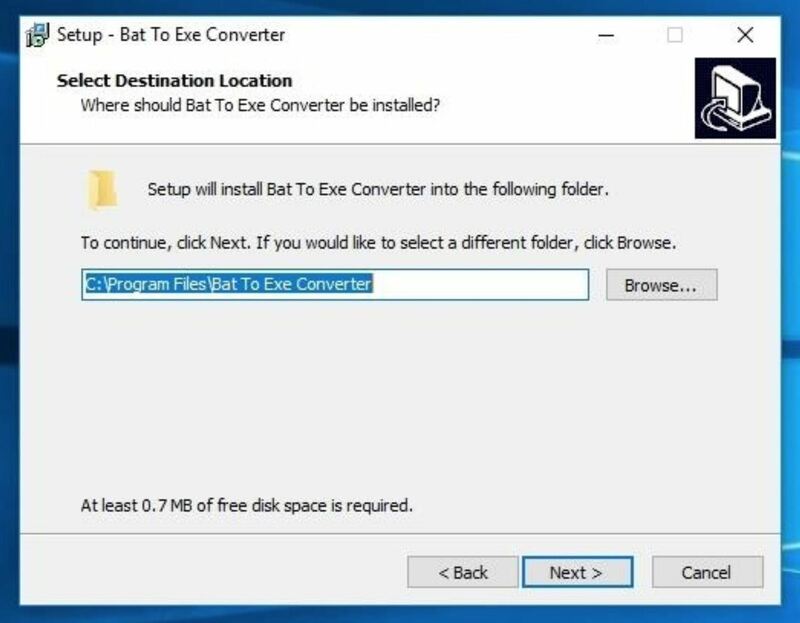 Unzip the download and run the "Bat_To_Exe_Converter_(Installer).exe" file to install it. When that's done, start B2E and click the "Open" button to import the payload.bat created earlier. Then, add the word "notepad" to the top of the payload.bat, and click "Save." This will make the executable open Notepad on the Windows machine before executing the PowerShell payload. Doing this will make the target user believe the file they just clicked on is indeed a legitimate text file. Now, there's a lot that can be done to further convince someone the file is legit. For example, if Notepad isn't their default text editor, it might seem suspicious that this one file opens Notepad when other text files open Notepad++, a popular third-party text editor. So improving the BAT to open a default program, instead of Notepad, might be desirable. Also, opening a blank Notepad when the file is reported as being 12 KB in size might also be suspicious, so finding a way to produce text or Trojanize the EXE to first download an actual text file might help improve the effectiveness of such attacks. For sake of simplicity, I'll continue as is, with the BAT opening a blank Notepad. This will hopefully demonstrate how easy it is to create trojans and get readers on the right track to developing this attack to meet their individual needs. 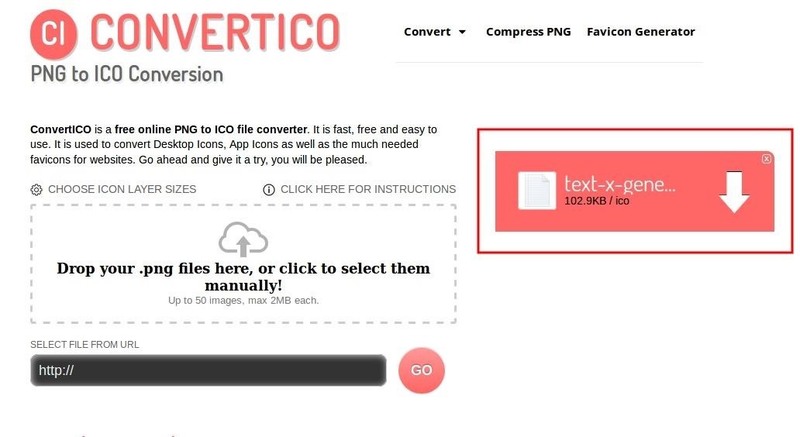 With that done, check the "Icon" option to enable it, and import the fakeTextFile.ico icon created in the previous step using the "..." button. 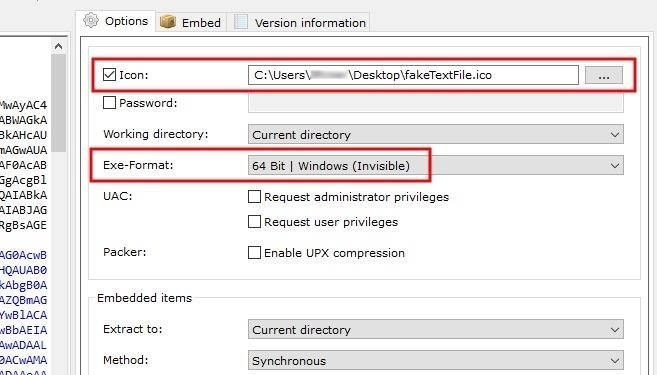 Then, change the Exe-Format to "64-bit Windows | (Invisible)" to prevent any terminals from popping up when the target user opens the file. Click the "Convert" button to create the EXE, and save the filename as fake.exe. After saving the fake.exe to the desktop and placing it beside a real text file, readers may notice a thin red line in the fake icon that doesn't exist in the real text file icon. This can be easily fixed by using a better Windows 10 icon set or by using a different type of file to spoof. The bigger issue is the file extension. 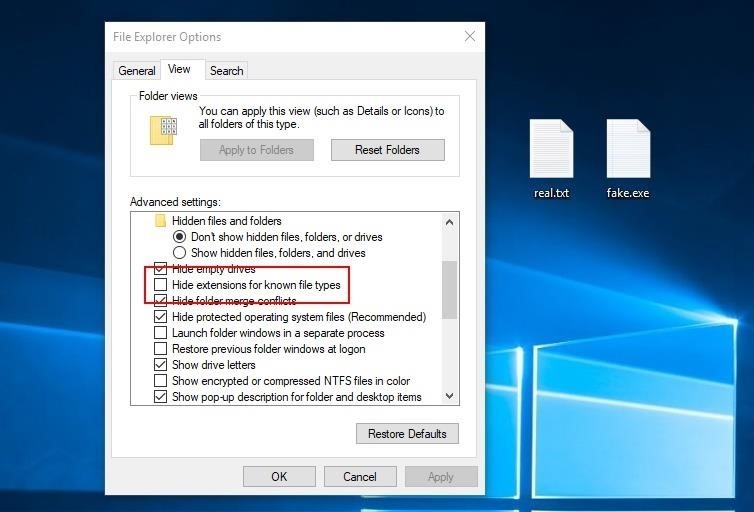 Thanks to the "Hide extensions for known file types" option in the File Explorer Options, file extensions are not being hidden by the Windows operating system. 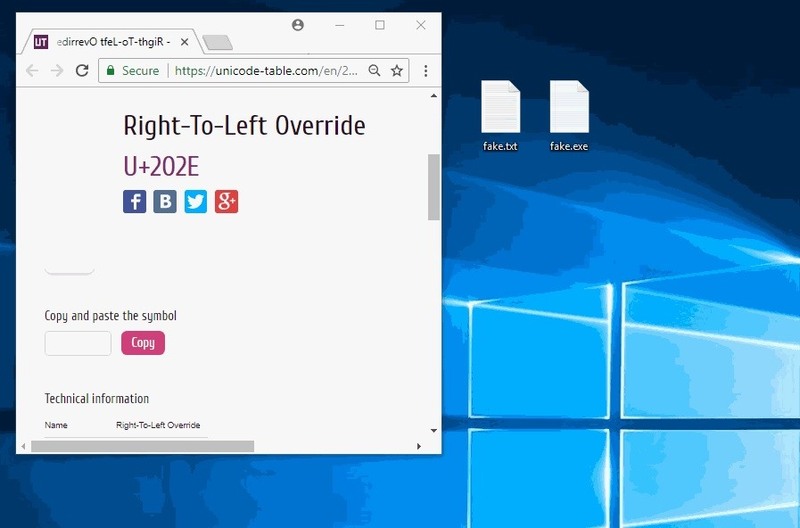 To get around this, use a Unicode character called "Right-to-Left Override" (RLO) to reverse the order of which the characters are displayed in the filename. That's important to understand since the characters aren't actually being reversed, how Windows displays the characters is being reversed. Windows will still recognize the file extension as EXE. As seen in the above GIF, the invisible RLO character is being injected between the file name ("fake") and the fake file extension ("txt"). All the RLO character is doing here is flipping the order the characters in the file name are displayed. Unfortunately, the "exe" must remain in the spoofed filename. Since our whole objective here was to create an undetectable payload, antivirus software is not really a good option for protecting against these types of file extension spoofing attacks. One thing you can do is just put on your magnifying glass when looking at files you download off the internet. In our case above, you won't be able to tell at first glance that the icon is not the same as other text files, but at closer examination, you'll see that something is fishy. If you're suspicious of a file or its source, try renaming it. Be careful not to double-click on it. Instead, right-click the file and choose the "Rename" option from the context menu. If Unicode is being used, renaming the file using characters found on standard keyboards will remove the Unicode, revealing its true extension. thanks for sharing. And i have some questions that it's worked on my windows but when i sent the same payload to the other windows computer ,it no responses ,is that because of the firewall ? or something else? are both you attacking and target computers within the same network and visible to each other? or is your target computer outside your wlan? This could be a port forwarding issue. Also, it could be a Windows Defender issue. You could check the Threat History log to see if your payload got caught! Thanks for sharing, a good tutorial but the second I opened the "text" file on a test machine McAfee Total Protection quarantined it. It would also be good to be able to attach this this to an actual text file so when it opens it shows the same file name and some content instead of opening a new untitled document. Another note to point out is that if the target does not have extensions set to visible then it makes the file look a little more suspicious as the name now contains the txt and doesn't show the extension so doesn't swap it around. The icon could be improved by a simple screenshot of the real icon for the target system and cropping it out and using that instead, maybe keep on hand a collection of ico files from different systems. did you find any better ideas ????!! Unfortunately, the "exe" must remain in the spoofed filename. is there no work around this? will adding a maximum space to the file name work out ? does this works on android phones too?